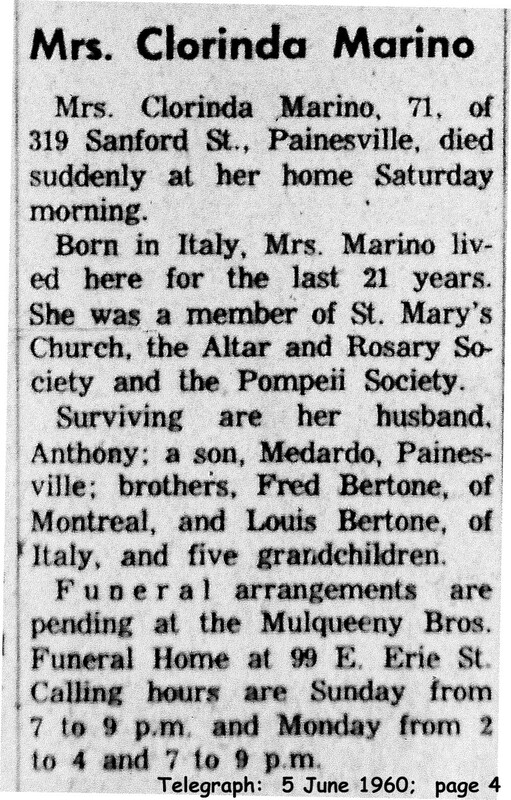 Clorinda Filomena Bertone first appears in the Painesville, Ohio, area in 1939. In America, Clorinda Filomena Bertone was known by her married name, Clorinda Marano. Clorinda Filomena Bertone, daughter of Francesco Bertone, was born in 1889, at Sant’Angelo in Grotte, Italy. She married Felicantonio Marano, son of Salvatore Marano. Clorinda died on June 4, 1960, at her home, 319 Sanford Street, Painesville, Lake County, Ohio. Her body was interred at Riverside Cemetery at Painesville, Lake County, Ohio. 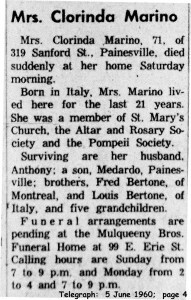 Clorinda Filomena Bertone immigrated to the United States on April 6, 1939, travelling to Painesville, Lake County, Ohio, joining her husband, Felicantonio Marano. She became a citizen of the United States on February 8, 1946. Clorinda resided at 319 Sanford Street, Painesville, Lake County, Ohio, when she was naturalized. 1. Medardo Salvatore Nicola Marano was born on July 27, 1920 at Santa Maria del Molise, Italy. He married Antonietta Yolanda Berlingieri. He died April 11, 199, at his home at Painesville, Lake County, Ohio. His body was interred at Riverside Cemetery, Painesville, Ohio.